Oklahoma's Largest & Most Attended Hamfest!!! 2017 Green Country Hamfest - April 7 & 8 in Claremore, Oklahoma. Free Parking!!! - Low Cost ON-SITE RV Parking! Terrific Prizes! Terrific Prizes! Terrific Prizes! Door Prizes Drawing Every Hour! Fantastic Forums - Friday Evening & Saturday - Learn something new! Free Test Table - Check It Before You Buy It! On-site VE Testing Get or upgrade your license! Who is up for #SelfPlaceSelfie participation? Do you know where your "safe place" is while you are at work, at home, or traveling? 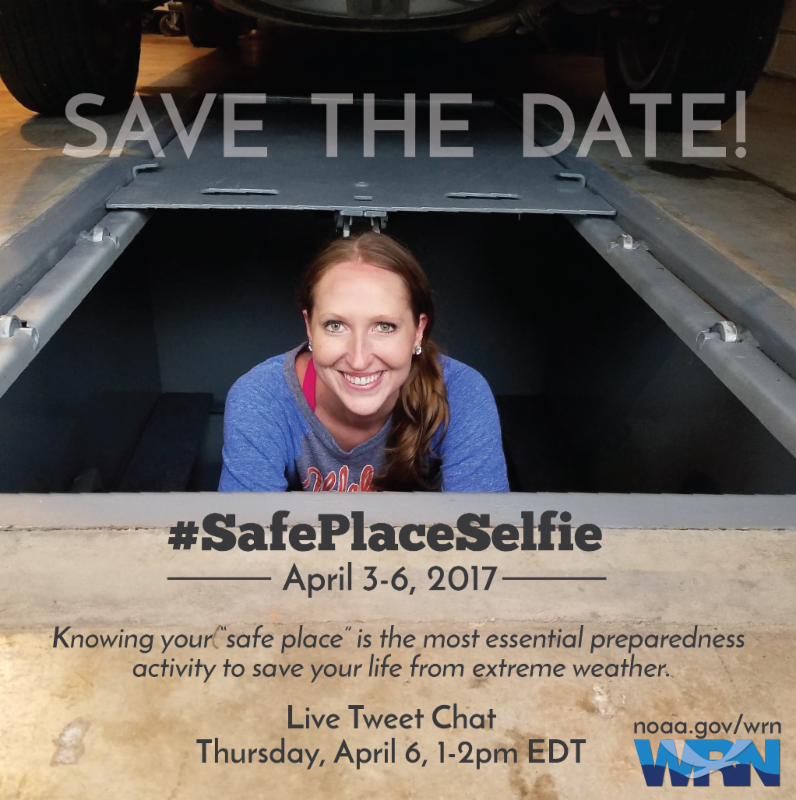 In early April we will be launching a 4-day #safeplaceselfie campaign over social media to encourage everyone across the country to take the #1 preparedness action when extreme weather threatens. Below are images we encourage our WRN Ambassadors to promote over the next month as we draw closer to April. Participate using your organization social media accounts (Twitter, Facebook, Instagram, etc.) or even your personal accounts. Below are some talking points that provide more details on how you and your organization can contribute. It is fun. It is free. And it will go a long way to building a Weather-Ready Nation! 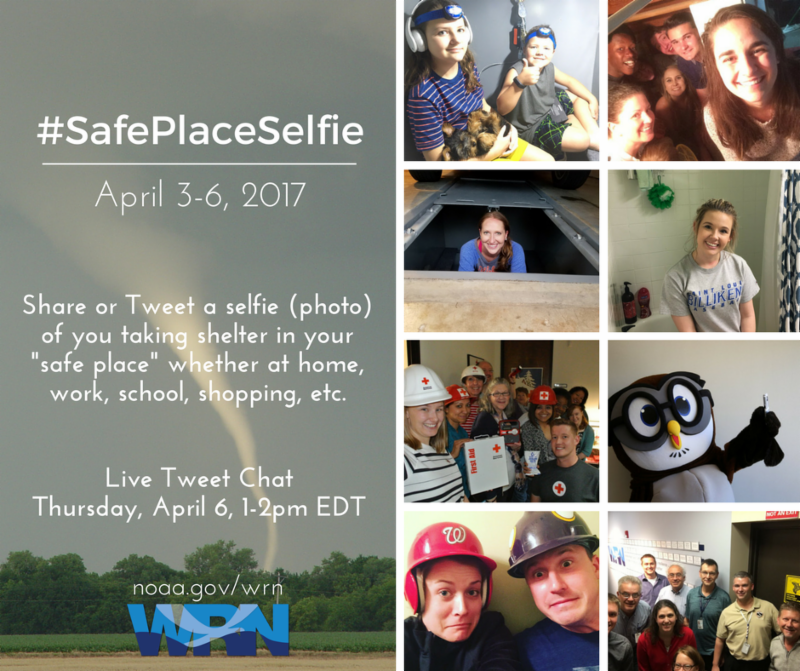 #SafePlaceSelfie is a grass roots campaign as part of NOAA's Weather-Ready Nation to get individuals, businesses, and all organizations ready, responsive, and resilient to extreme weather events. Knowing your "safe place" when extreme weather threatens is the #1 preparedness action anyone can take. To this end, a social media campaign will be launched the week of April 3, culminating in a TweetChat on Thursday, April 6. Encourage other accounts on social media by tagging them and asking "Where is your safe place?" And your safe place may be very different for the various hazards. For instance, a car may be a safe place from lightning, but is a dangerous place during flash flooding. Get creative! Is there a beach nearby or are locals planning vacations to warmer climates? Help spread rip current awareness by focusing on where your safe place would be (hint: between the lifeguard flags). At GreenCountryHamfest.org, early registration and additional information is available. Early registration ends March 31. A number of prizes are listed to be given away also. Thanks to Mark, N7XYO for this information. In the mean time Eddy Manley K5EMS is helping with compiling net reports. 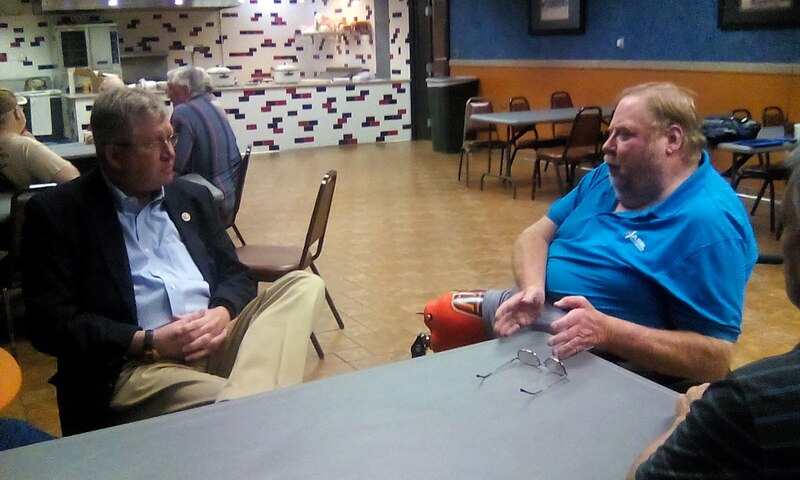 A special "non-ham" guest was on hand for the Elk City hamfest March 4 when Oklahoma Congressman Frank Lucas came to visit the scores of interested attendees there. Lucas spoke to the issue of restrictive covenants homeowners face when buying housing that prohibits amateur radio ... and other antennas. Additionally, those listening heard how to write, email, call, and visit their elected officials at the Federal, State, and local levels. Lucas, a non-ham, mentioned his appreciation of the work that hams have done and continue to do in service to their communities. He did note, however, that the public perception of ham radio is a user with old tube type equipment using "AM radio" signals. He learned the various methods "hams" use to communicate including digital radio techniques and satellites. at the Elk City Hamfest. Other items discussed were tower light requirements being proposed, the "generator bill", work on "fixing" the text and drive bill, the needs for clubs to have their public information officers work with one another to get the word about local offerings, and the section APRS and VOIP nets. 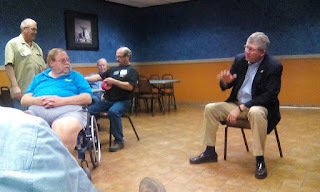 Overall, the effort was informative and well received, according to Kevin O'Dell, N0IRW, ARRL Section Manager. The Citizen Emergency Response Teams (CERT) teams in the Tulsa area will be conducting an exercise on April 1 in Jenks. They have a need for up to 6 licensed amateur radio operators. The exercise will include resources from Jenks, Skiatook, Bixby, and Broken Arrow. This is a superb opportunity for our ARES members in the area to get some on-air practice. Thanks to Paul, WB5ANX for this update. Are you participating in APRS? What’s the Automatic Packet Reporting System? APRS is a computer-assisted (digital) mode of amateur radio communication. Accuracy is one advantage of this digital mode. Without the correct software (which is easy and, in most cases free, to get) the information is unintelligible to the casual listener. What is an APRS net? The OKAPRS net occurs from 1300 to 1400 CT on the second Saturday afternoon of every month. The purpose of the net is to test APRS stations and operating practices. In the most basic form, amateurs check-in to the net by sending a brief APRS message to the net controller. More seasoned operators are welcome to join the OKAPRS group on ANSRVR and exchange items of interest to area hams. Participants with TNCs or Soundcard-based TNC emulation software (UZ7HO and the like) can use their PCs and radios. Others can check in with PCs / tablets with Internet access. There are also APRS apps for popular smartphones. A particular advantage of APRS compared to other digital modes is that communications are usually backed up in the APRS-IS system of servers. Websites such as findu.com and aprs.fi can help you easily mine those records to assemble a log of a particular net. We’d love to have you join us any way you can. STEP 1: For your first check-in, use the web tools mentioned above! STEP 2: Next time, consider checking in from your iPhone or portable device. You’ll need an Internet connection of course. STEP 3: After a few months, you’ve caught the bug. Try APRSIS32 software on a PC with Internet. STEP 4: You’ve added a rig interface and a VHF radio to APRSIS32. You’re truly “on the air”. APRS stations that include a radio are the most resilient and useful in a time of emergency. Who is the Net Controller? The Net Controller is typically KD5NJR. He’d mostly likely be operating from his desktop portable APRS station (not handheld) with the callsign KD5NJR-6. He’d use other rigs for backup and monitoring purposes; so don’t be alarmed to see a -7 or -8 out there too. To double check, look for an APRS bulletin referring to the net coming from the NCO station. Or look for a pre-net message. That’ll probably be sent from the NCO. See what station it is coming from. You can also look for an APRS object referring to the net control operator. He might identify himself ! See more about objects and messages later on. For ease of operations, the NCO probably wants to use a minimum of a laptop computer setup with Internet connectivity to the APRS network. A radio connection is strongly encouraged. For best results, the NCO should be able to easily hit an APRS digipeater on low power to make your battery last the duration of the net. I’d also suggest having a TX/RX digipeater (ex: AE5ME) within a couple hops of your QTH. Having Internet connectivity at your QTH will allow you to see the APRS activity via the IGATES on your web browser (aprs.fi or similar) as a backup. In particular, you’ll see the users with just APRS software. This is a good thing if your nearby IGATE is not set to transmit and is configured “RF in to Internet “only. Since the “audience” may be using a small screen like on a HT or flip phone, (see photos later on) you’ll want to keep transmissions short. The focus of the net (with the exception of the portion on the ANSRVR chat group) should be around brief equipment tests. They’ll check in. You’ll acknowledge them. Call for more checkins. Repeat. Close the net. Objects are things like repeaters, Field Day sites, Bike Race water stops, etc. The OKAPRS NCO could be an object. Make it so! Send a few messages similar to the above to QST or ALL or CQ. I’m not sure what best practice here is. QST and ALL seem to work on my FT-1 Radio. CQ OKAPRS QST de kd5njr, taking checkins for net. CQ OKAPRS QST de kd5njr, closing net. 73. Also add to the log folks that chat in the ANSRVR group. Several times during the hour solicit check-ins using messages. Add them to your log. kd5njr taking checkins for net. kf5tvg tnx for checkin. Ur in log. Short and sweet! Take notes so you can form a log. Send a message closing the net. Do the same over on the OKAPRS group. I have been using RF with a path of wide1-1, wide2-2 so that I can hit an igate. To rely LESS on the IGATES, I have not been checking ‘BEST’ but instead choosing RF when possible. May I suggest you communicate to others that you’re a computer using the -10 SSID ? For smartphones, Bob WB4APR seems to suggest -5. For my ’72 I’m using -7 and -9 for my FT-1. He was at the Broken Arrow Christmas Parade. the two most popular web sites for viewing the APRS-IS database are www.aprs.fi and www.findu.com . Findu.com certainly gets the job done. It’s got a little simpler layout. --Eventually I’ll have links and photos for both websites. Findu.com is unique in its facility to SEND APRS messages. Note: Your message’s recipient, if using ONLY a radio for his APRS setup, will have to be in range of a 2-WAY (bi-directional or TX/RX IGATE for best results) Otherwise, you maybe not receive back ACK of your messages. Let’s say we think Scott is the net controller. What interesting is going on around him ? Is he sending any bulletins or objects ? Since Scott is at the parade, he isn’t sending a NET TODAY bulletin. The APRS NET bulletin is coming from Jeff. It matches the LAT/LON of his AE5ME-10 station. Edit this hyperlink below to reflect the callsign and SSID of the net controller. Cut ‘n paste into your favorite web browser and you should see the recent activity to/from that particular station. You’ll need to periodically ‘refresh’ your browser. You’re “receiving the net “ !!! Edit this hyperlink to reflect the callsign and SSID of the net controller. NOTE: similar functionality is available on APRS.fi See later on in this document. You can try it out, but it’s pretty disorganized. And not really by topic. I’ve found that www.aprs.fi works pretty well on the iPad. But there is an APRS.fi app as well. The app doesn’t really help you send messages or view them, but it can turn your phone into an APRS tracker. For those in the Android universe, here is an option. Apple iPhone users may investigate iBCNU or another program in the App Store. But that screen is awfully small to be tapping stuff on the map and otherwise navigating around. While not the low-cost option, this method uses a lower overall number of “parts” and uses the Internet to lesser extent than other methods. After all, it’s amateur radio. You can see that brevity is important. I need some more practice on the FT1. I think I keep looking for the hyphen when entering the callsign / SSID. If you don’t mind the initial set up of subscribing to the group and typing the extra CQ OKAPRS (or finding an old message to edit that already has it ) ANSRVR is a more graceful way communicate in bulk. It’s preferable to QST or ALL as those methods will activate a lot of radios depending on your path. This is probably the best way to fly. APRSIS32 is still under development / support and has an active user community. APRSIS32 can be configured to use the Internet and/or a radio setup. For initial setup help, refer to G4ILO’s YouTube video. When possible, I try to use APRSIS32 to participate in the net. I didn’t take a picture, but see link below. I’d think the VIEW option would be appropriate. Use the white TX box underneath the gray receive box. Remember to experiment with the BEST or RF tickbox. Don’t forget to press SEND. Each additional message much start with CQ OKAPRS or ANSRVR doesn’t know how to route. But to configure the system, you must make some initial tests over RF. It could be unwieldy to use SMSGTE this way. You’d get a flood of messages potentially. Thanks to Scott Haley, KD5NJR for this information.